No more searching through the drawer! This set of five Magnetic Measuring Spoons stick together and stay organized. The spoons are double-ended so you can measure dry in one end and wet in another, and flat-bottomed to stand without spilling. Stainless steel magnetic measuring spoons are great for preparing recipes from The Diabetes Comfort Food Cookbook by Robyn Webb. Winner of the 2011 International Gourmand Award: Best Nutrition and Health Cookbook in USA, this cookbook is filled with 133 amazing recipes for people with diabetes who want to enjoy classic comfort food without the guilt. 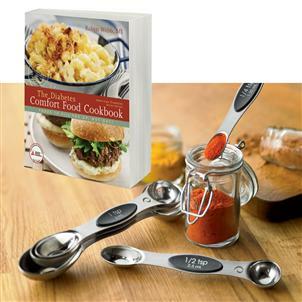 I actually bought the spoons for myself and the cookbook for my grown (type 1) son. He loves to cook. As it turns out I love the spoons, they set on the counter perfectly and will attach to anything metal. Having one end for container spooning and the other for liquid is a cook's dream. My son loves them too. Then I looked through the cookbook and I loved the recipes. Since he lives too far away to borrow it, I have decided to buy an entire new set so we can share ! Very used and helping to support Diabetes Research what more could I ask ! Thank you !